Stanley’s had these cute little Boston Lettuce heads for sale. The leaves looked perfect to make a wrap with. 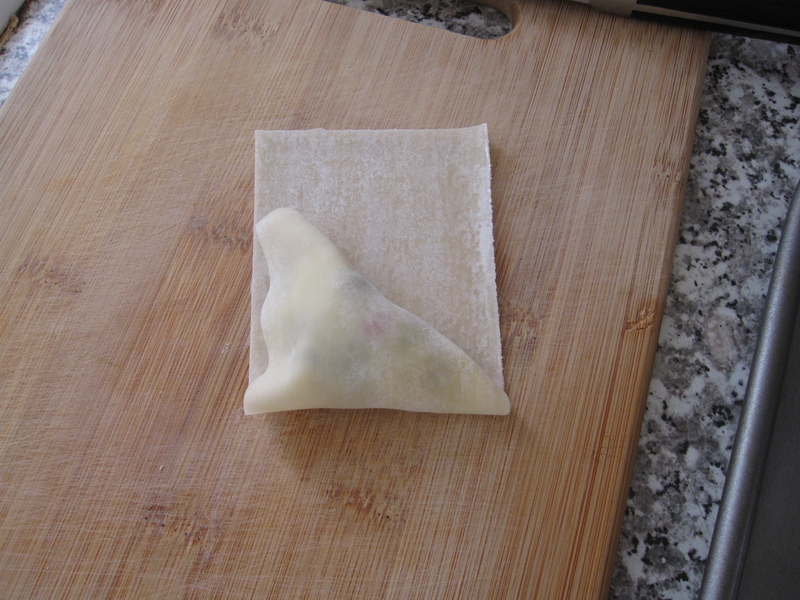 Then I remembered talking to Yuki about how we haven’t had ginger pork in a while, actually her craving for it. Sometimes I get it. Not often, but this time I did. 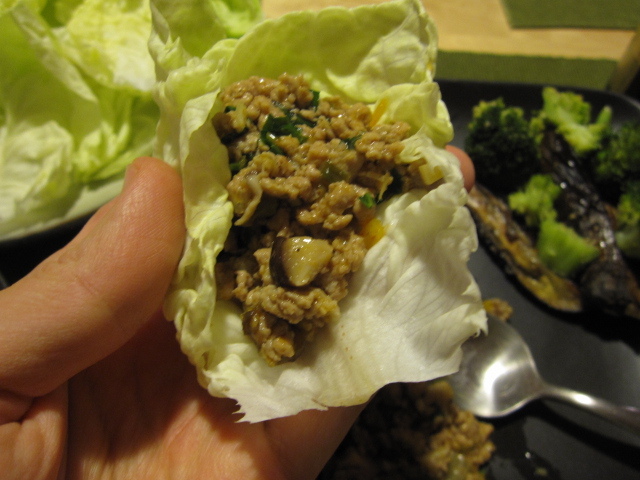 What better way to put some ginger and pork together than in the buttery leaves of some fresh Boston Lettuce? 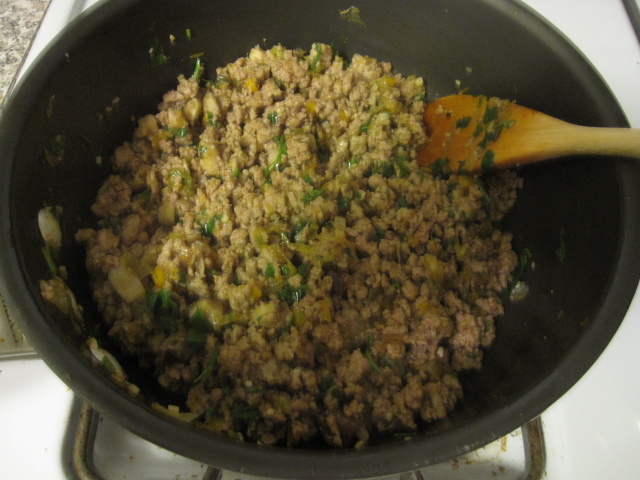 Laap is simply a Laotian ground meat dish. I can either be raw or cooked. 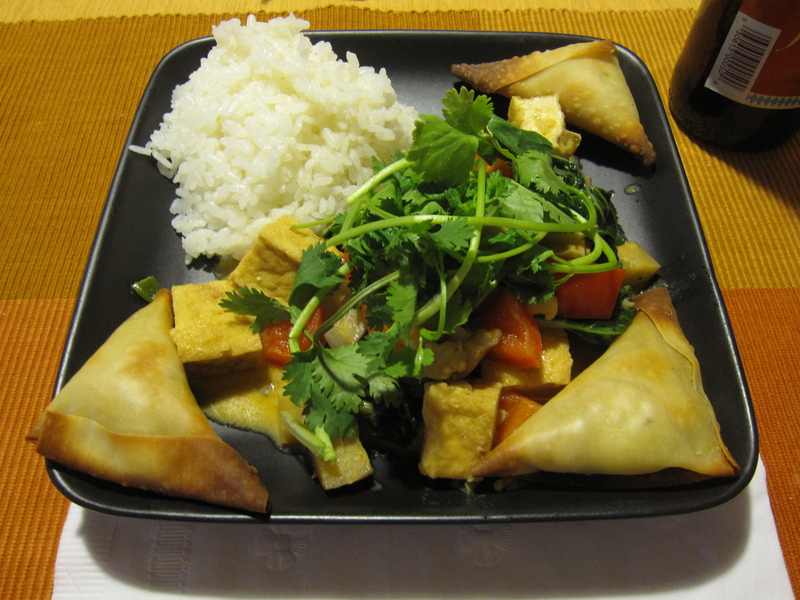 This one is more of a Southeast Asian flavor instead of a typical laap. I used a handful of parsley chopped (cilantro would have been prefered, but I had to use up my parsley), 7 shiitake caps diced, 1 yellow bell pepper diced, 2 stalks of lemongrass tender innards thinly sliced, juice of 1 lemon (prefer lime but thought lemon would match parsley better), 1/2 inch ginger minced, 3 garlic cloves minced, 6 green onions sliced, 1 head of Boston Lettuce large outer leaves used for wraps while the small inner leaves were chopped up, 1 tablespoon fish sauce, 1 tablespoon of sesame oil, 1 tablespoon of sriracha, and 1.25 pounds of ground pork. 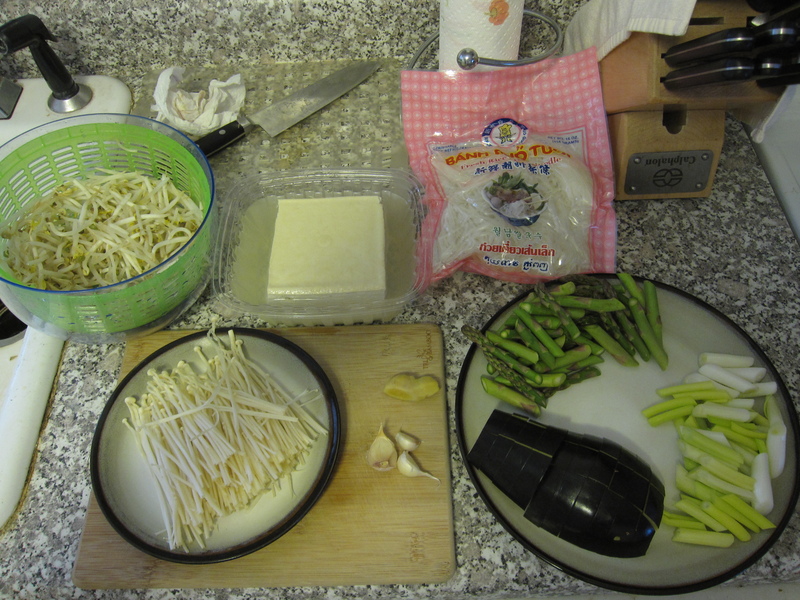 I also used 1 tablespoon of soy sauce, but that wasn’t in the picture. 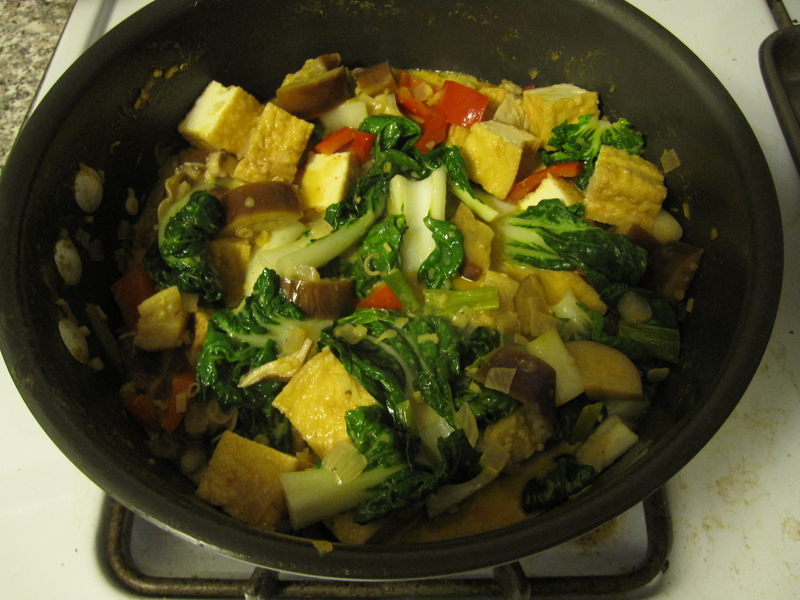 I heated up some vegetable oil and added the lemongrass, ginger, and garlic. 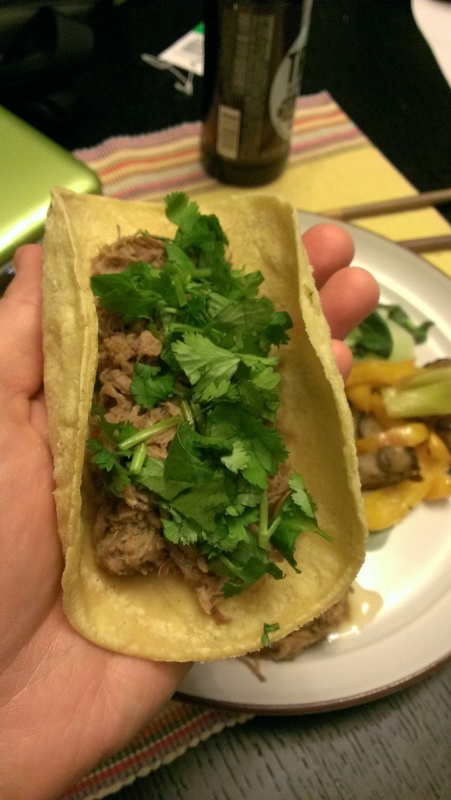 I let them sizzle for about a minute and then added the pork. 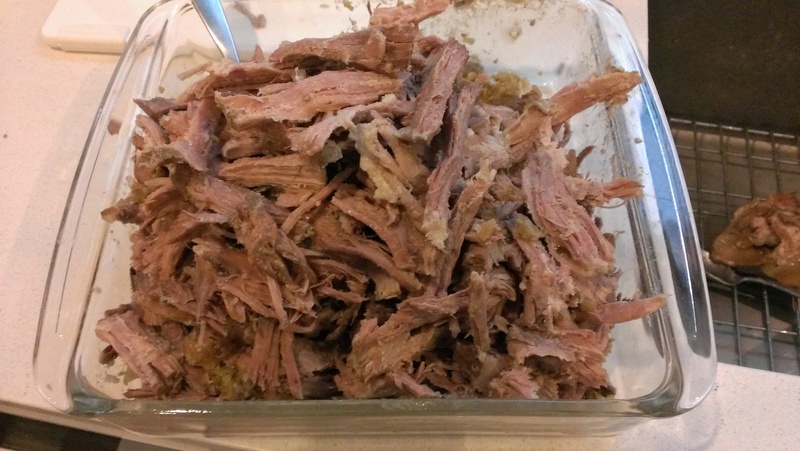 I broke the pork up as it cooked through, that took about 5 minutes. 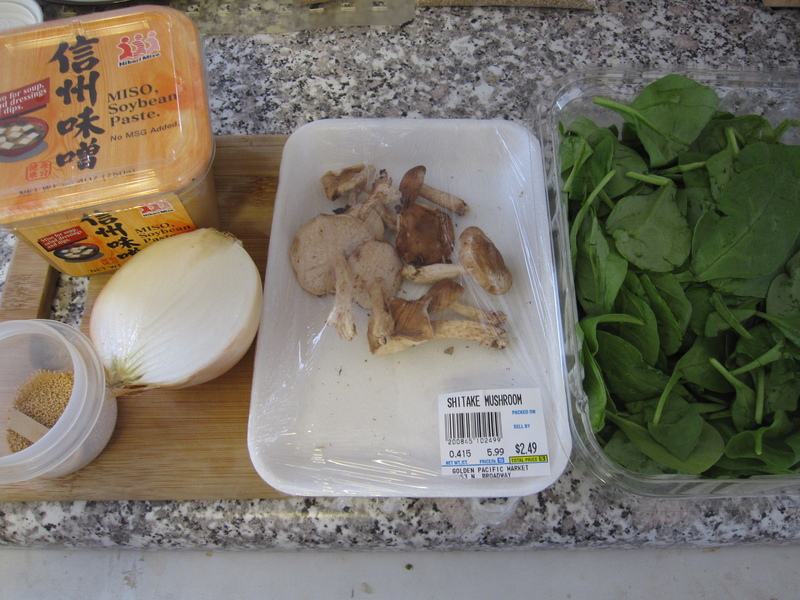 Then I added the shiitake, pepper, and green onion. 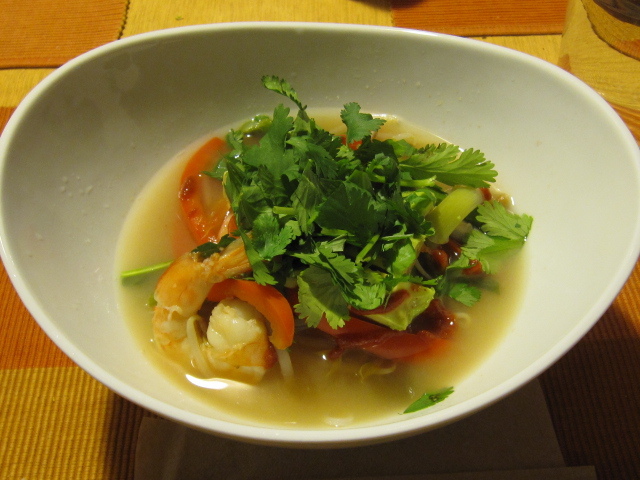 I let those cooked down for about 3 minutes and then added the fish sauce, soy sauce, and sriracha. After the sauces cooked down for a few minutes I turned off the heat and stirred in the parsley, lemon juice, and sesame oil. 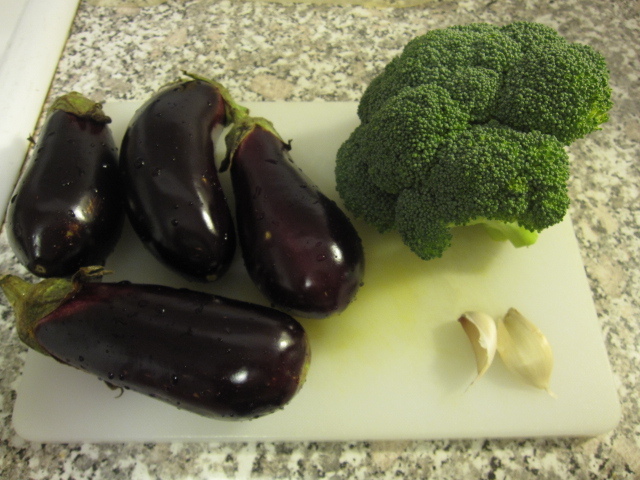 For side vegetables planned on sauteing some baby eggplant and broccoli with garlic, but for some reason I ended up quartering the eggplant and roasting it at 350 degrees for about 20 minutes in sesame oil while steaming the broccoli with ground sesame seeds. I didn’t use the garlic. 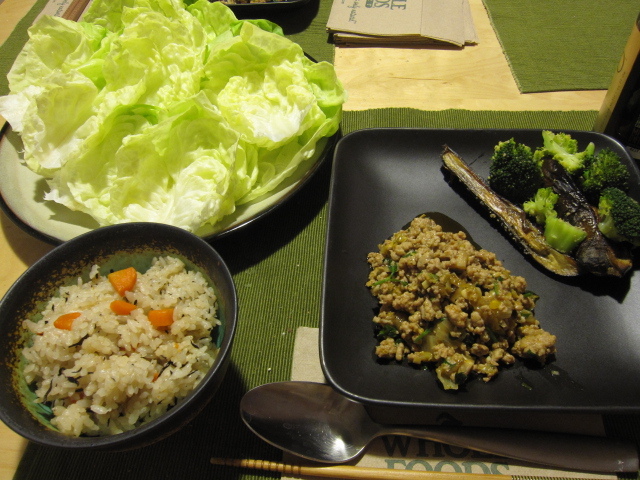 The rice I made was Japanese style. Not really the best match, but not bad. 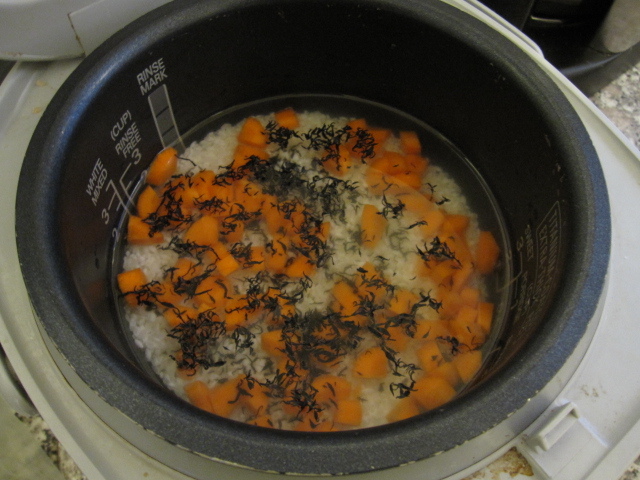 In the rice cooker, once I rinsed 2 cups of rice and filled the bowl with the right amount of water I added 1 diced carrot and a few pinches of dried hijiki seaweed. I let it sit for about a half hour before turning the machine on. I made sure to mix the carrots and hijiki in well before serving. I needed to use up the rest of the coconut milk I had from the other night so I decided to use it as a marinade for some chicken. I really wanted to grill the chicken, but the wind kept putting out my burner, one of the downfalls of a gas grill. If I ever have a metal balcony instead of a wood one I’m getting me one of those big green egg grills! 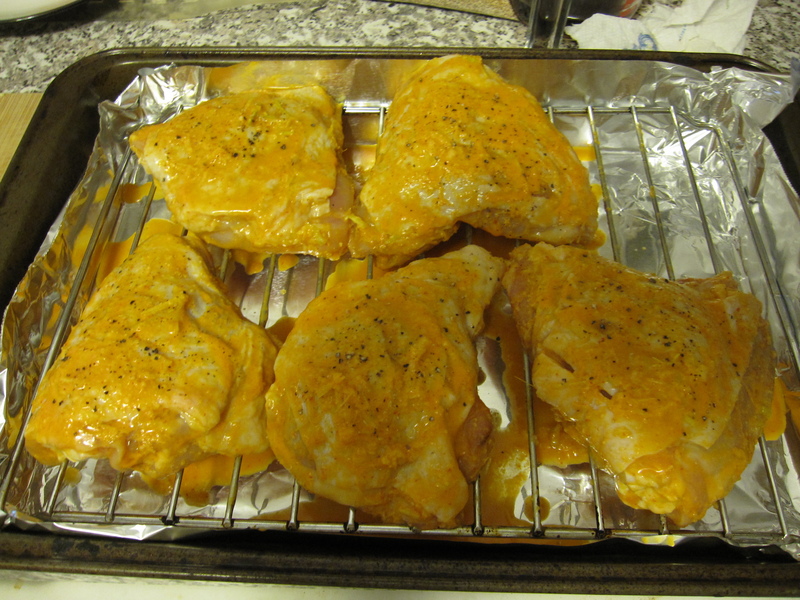 No worries though, I just threw the chicken in the oven as that sure beats raw poultry. 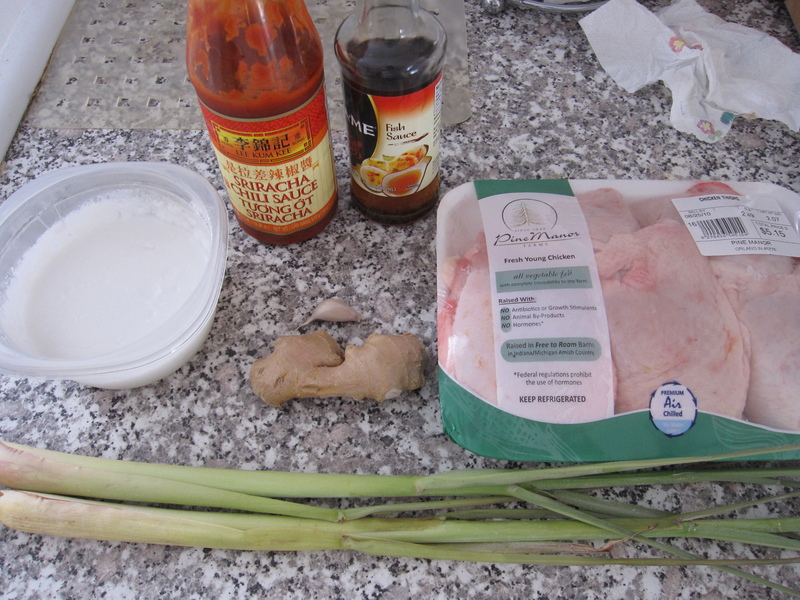 For the marinade I had about 1/2 cup left of the coconut milk. 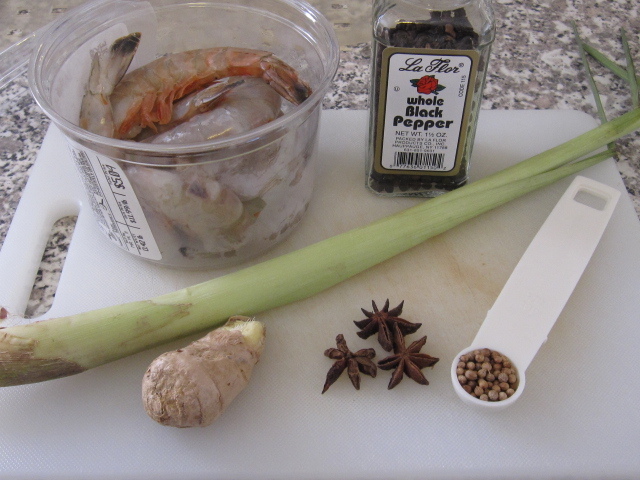 I poured it into my blender and added two chopped up lemongrass stalks (just the non-fibrous center), 2 tablespoons of sriracha, 1 tablespoon of fish sauce, 1 garlic clove, and 1 tablespoon of ginger. 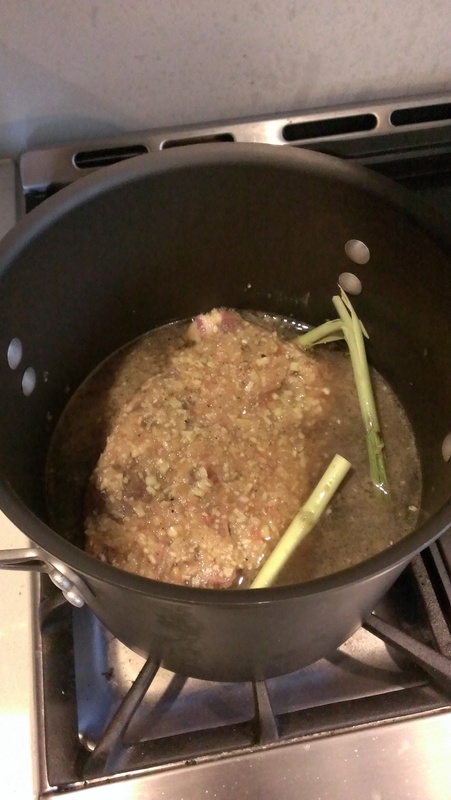 I blended it all up and poured it over 2 pounds of skin-on bone-in chicken thighs. Prior to pouring the marinade over I did score the skin with three slashes so that the marinade would penetrate the skin nicely. 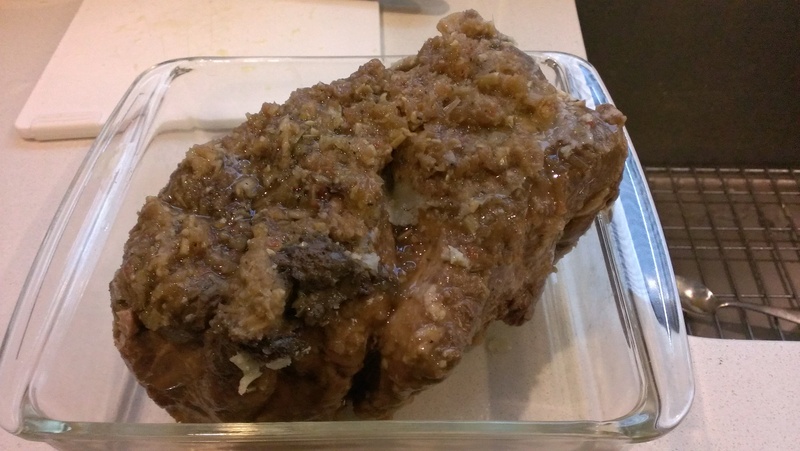 I covered it and let it sit in the fridge for about 4 hours. I took it out about 45 minutes prior to cooking and cracked a little black pepper on top just before going under the heat. Since the wind didn’t cooperate with me last night I heated my oven to 425 degrees and cooked the chicken on the upper 3rd for about 15 minutes. 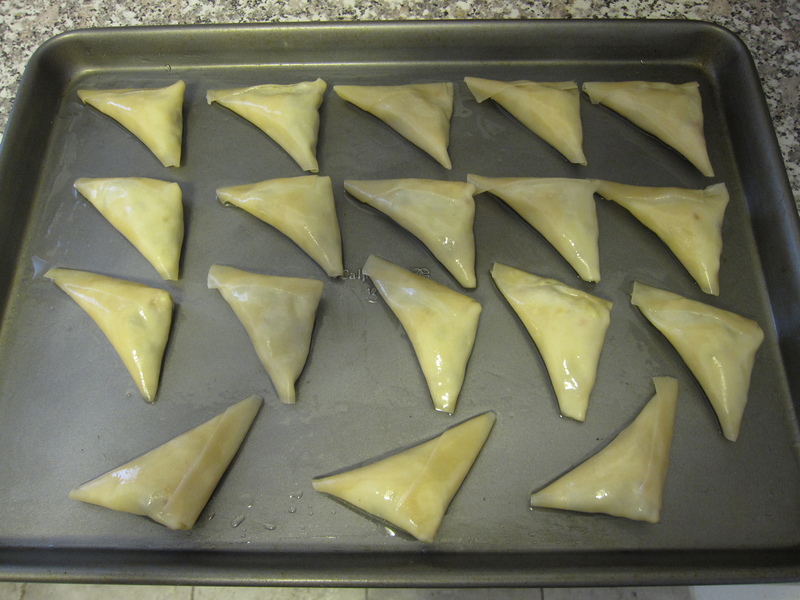 Then, I turned the oven to the broiler setting and let the skin get nice and crisp for about 5 more minutes. For my side I made some Thai flavored asparagus. 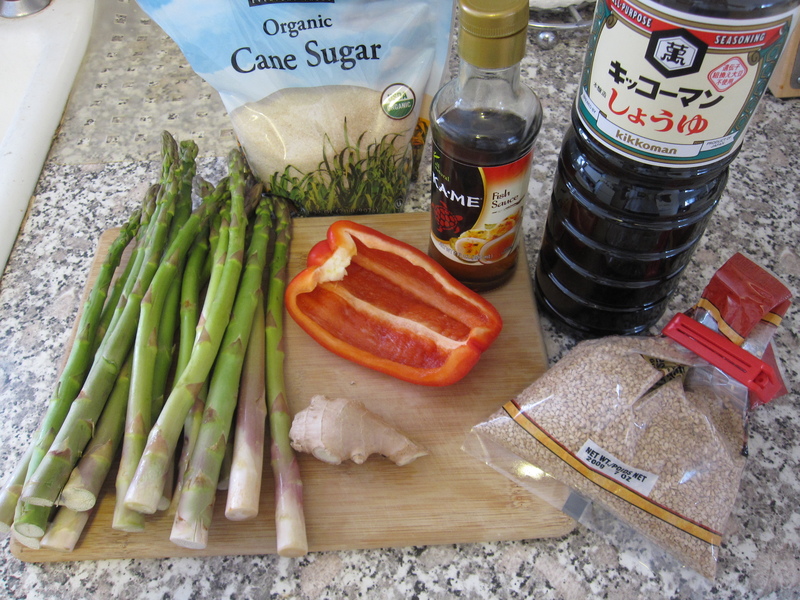 For the flavoring I used 1 teaspoon of cane sugar, 1 inch of ginger cut into slivers, 1/3 red bell pepper small diced, 1 tablespoon fish sauce, 1 tablespoon soy sauce, 3 cloves of garlic minced (didn’t make it into the pic) and 2 tablespoons of sesame seeds. 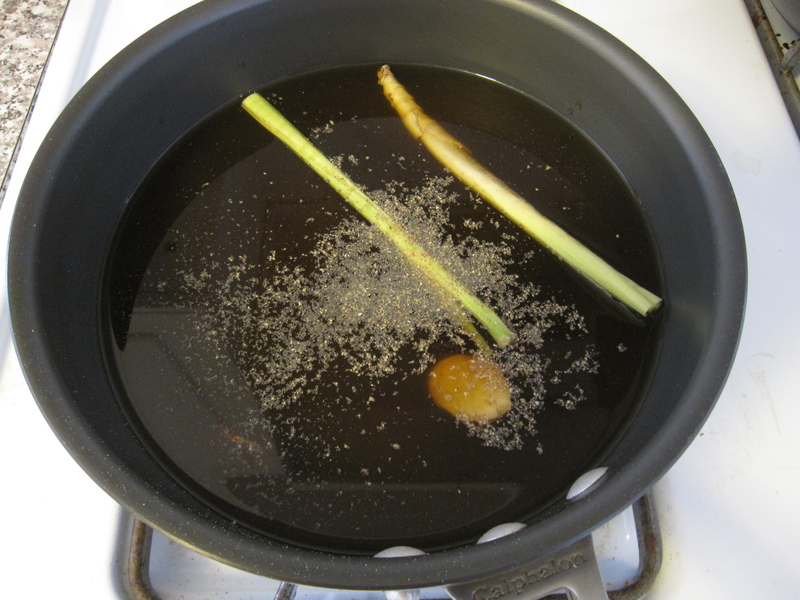 First, I mixed together the sugar, fish sauce, soy sauce and 3 tablespoons of water. I set that aside. In a skillet large enough to handle the asparagus in one layer I heated up 2 tablespoons of sesame oil and added the garlic, ginger, and sesame seeds. 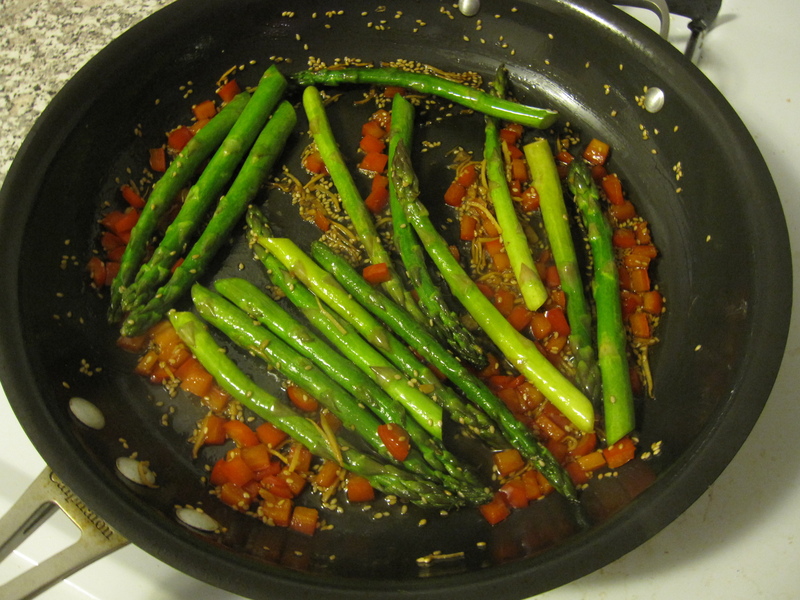 I let them sizzle for about a minute or two and then added the asparagus and red pepper. 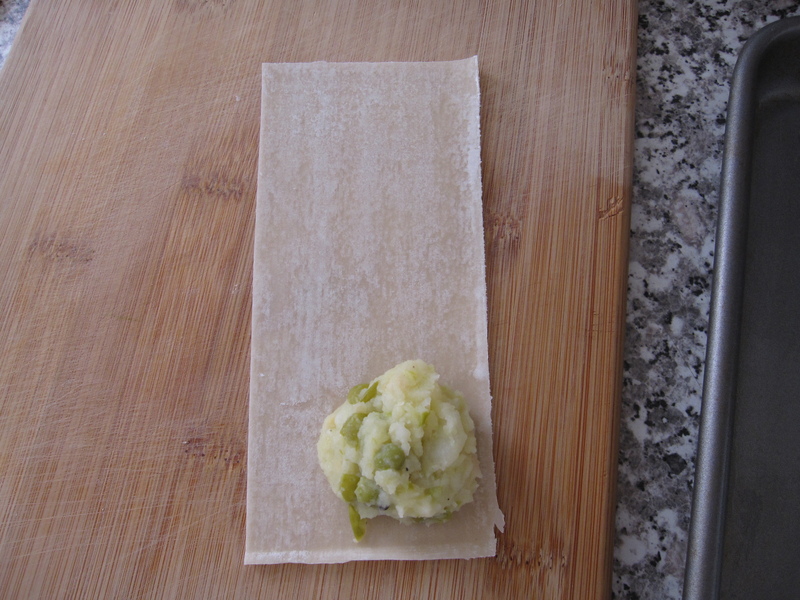 I rolled it around to make sure the asparagus was completely coated with all of the flavors. After 4 or 5 minutes I poured in the liquid and let that boil off for about 3 minutes. That’s all I did for this side. 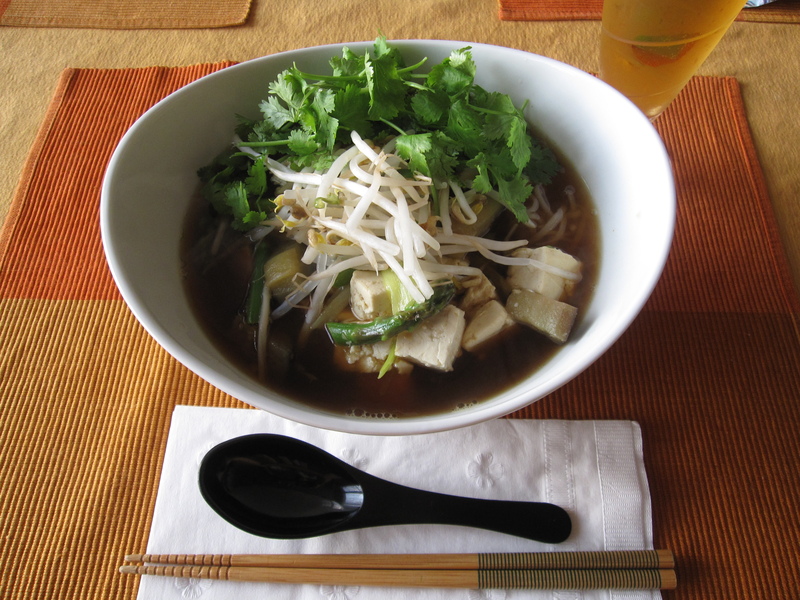 I also made some miso soup. 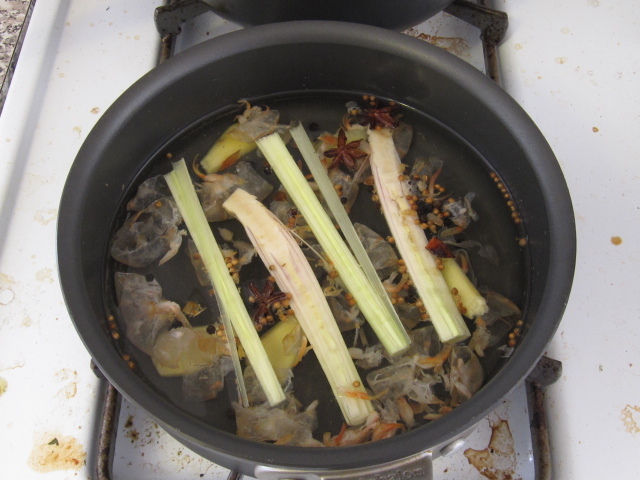 In a pot I poured in about 4-5 cups of water and brought it to a boil with 1/2 an onion sliced, the rest of my shiitake sliced, and a few pinches of dashi-no-moto. 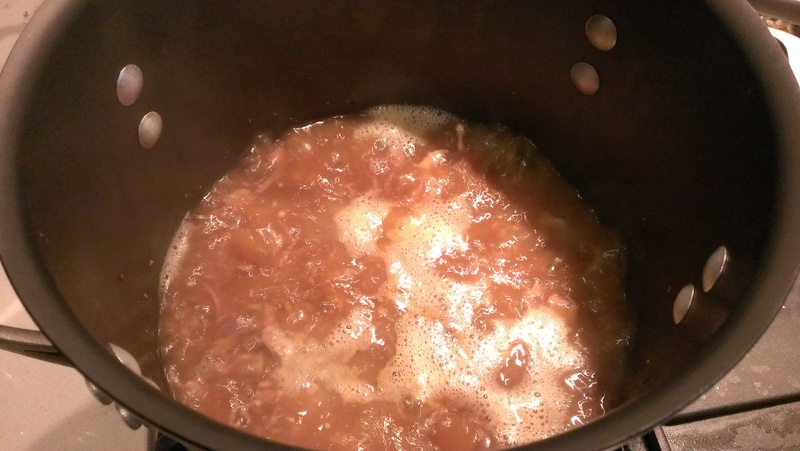 I let it boil for about 15 minutes until the onion was softened. Then I threw in a large handful of baby spinach and let that boil for another few minutes. 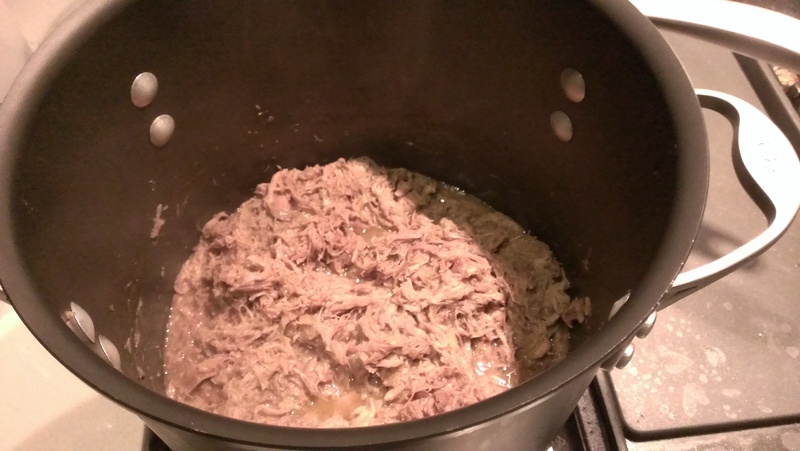 Finally, I took two large tablespoons of shiro miso and mixed that in. 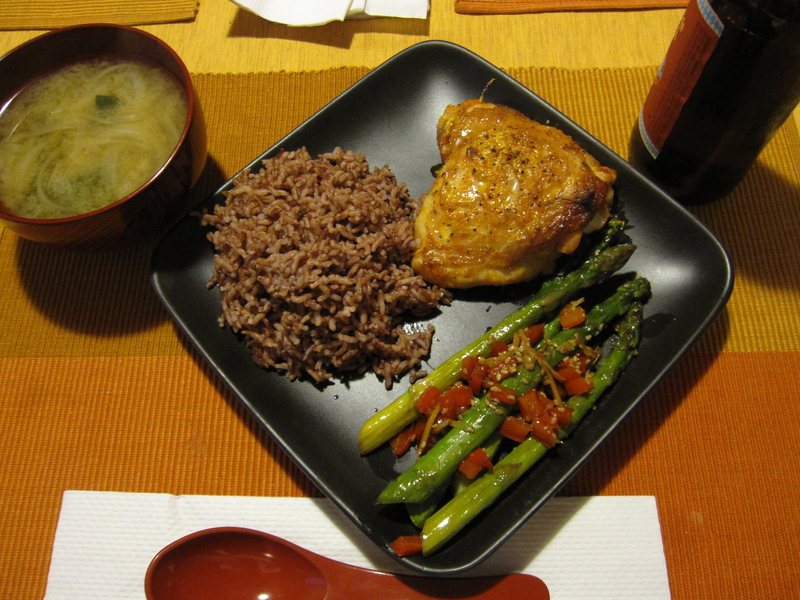 Besides the asparagus and miso soup I served some Thai Red Rice instead of regular white rice. 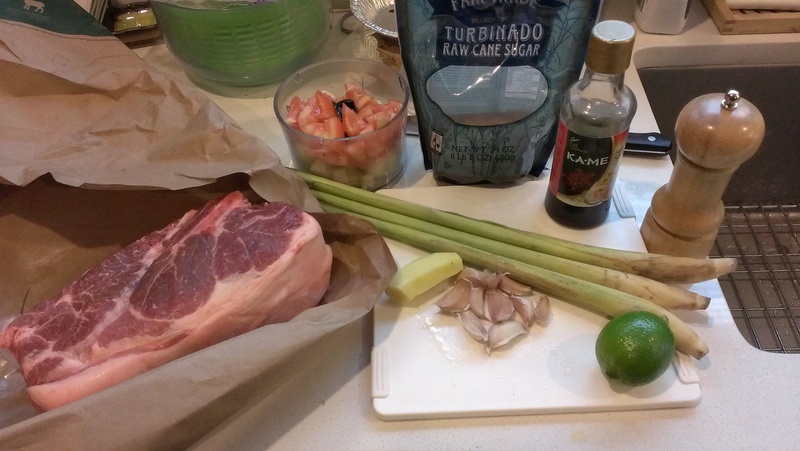 While this was one of the tastiest marinades I’ve whipped up in a while I did forget two things. I wanted to squeeze some lemon juice on the chicken as soon as I took it out of the oven and I wanted to garnish with some cilantro. I guess I’ll use that lemon and cilantro some other time. 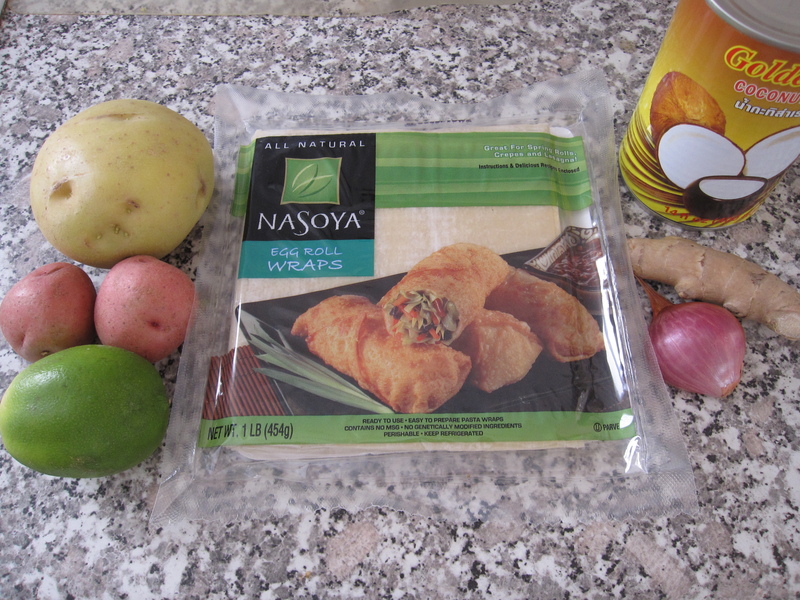 I was at the store the other day unsure of what I wanted to make for dinner. 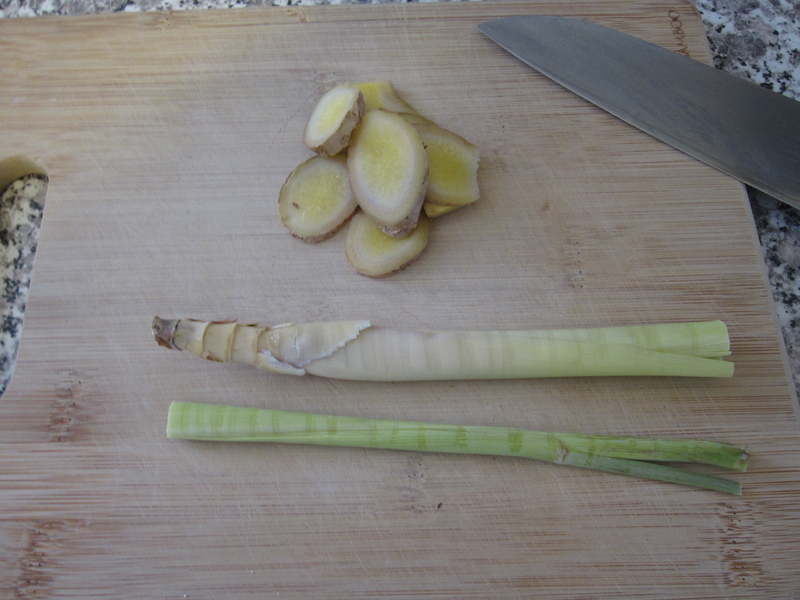 I saw some beautiful fresh lemongrass stalks I immediately knew that dinner was going to be lemongrass chicken. 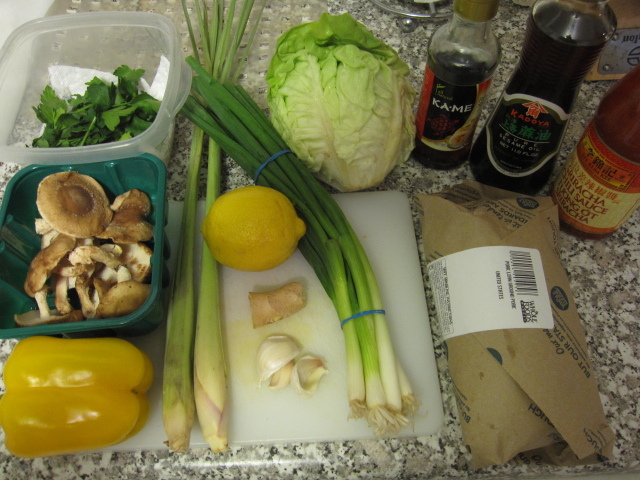 I’ve made lemongrass chicken a hundred different ways before, and the possibilities to make it are endless, so I just kept looking at what looked fresh and built my dinner from there. 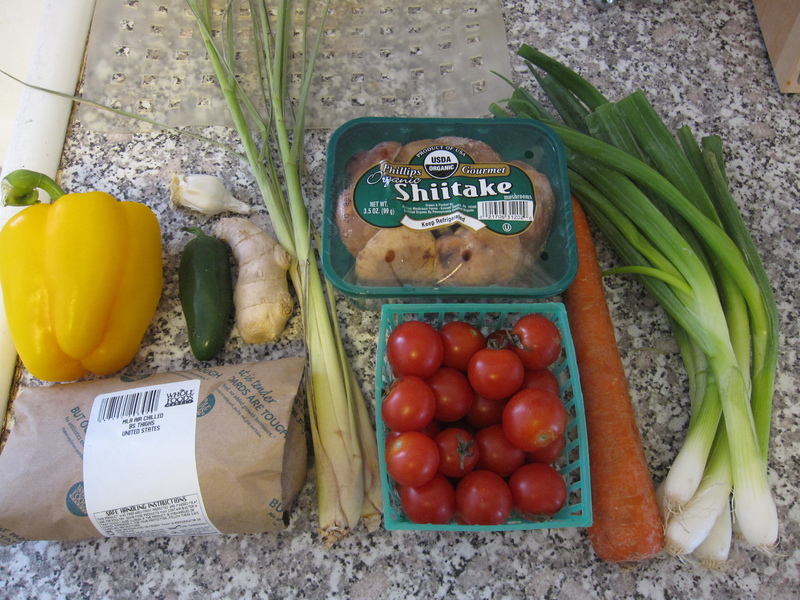 I grabbed a yellow bell pepper, just shy of 1 pound of skinless/boneless chicken thighs, a jalapeno, 4 garlic cloves, a piece of ginger, two lemongrass stalks, some shiitake mushrooms, cherry tomatoes, a carrot, and some green onions. 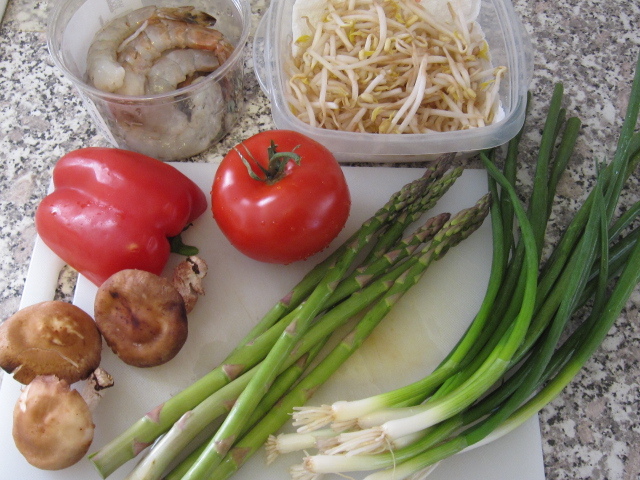 The pepper got chopped up, the chicken thighs cut down into bite sized pieces, the jalapeno diced, the ginger and garlic minced, I removed the outer layers of the lemongrass and sliced up the soft white inner part, I sliced up 6 of the shiitake, halved 12 tomatoes, and chopped up the carrot and 6 green onions. In a hot pan I poured in 1 tablespoon each of soy oil and sesame oil and then tossed in the ginger, garlic, and lemongrass. 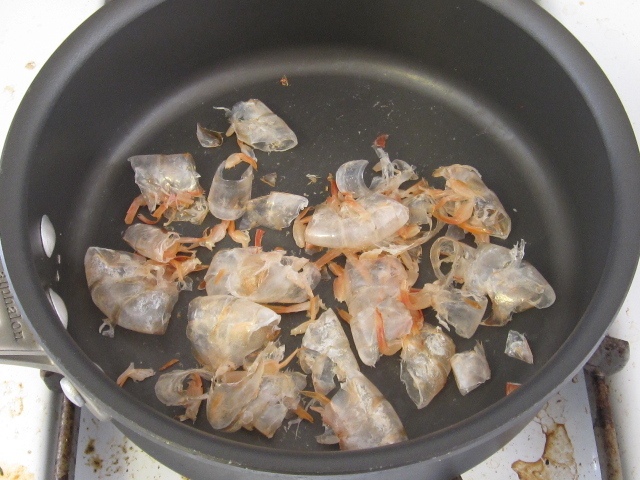 I let the go for about a minute until they became very fragrant. 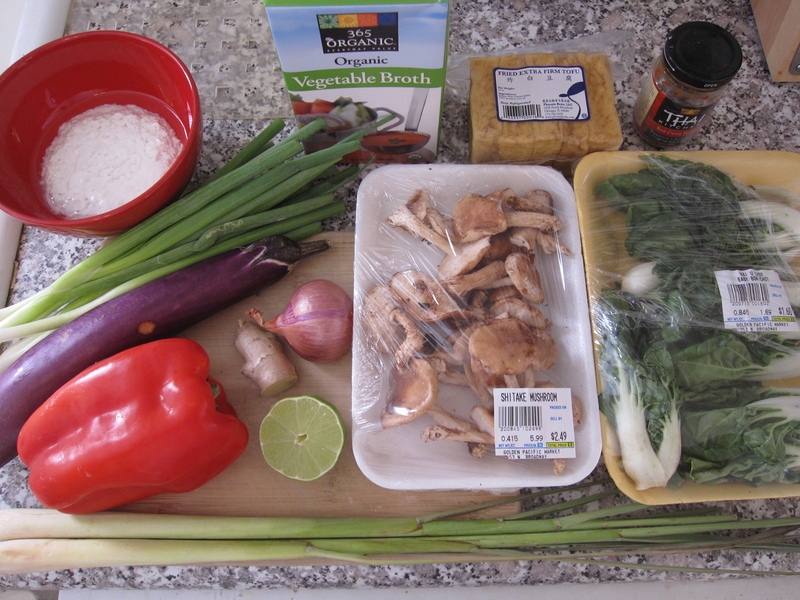 Then I added the green onions and carrots. 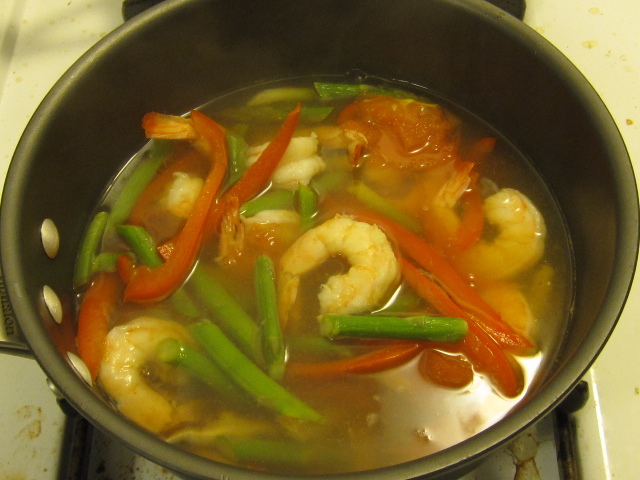 About 3 minutes later I tossed in the bell pepper and jalapeno. 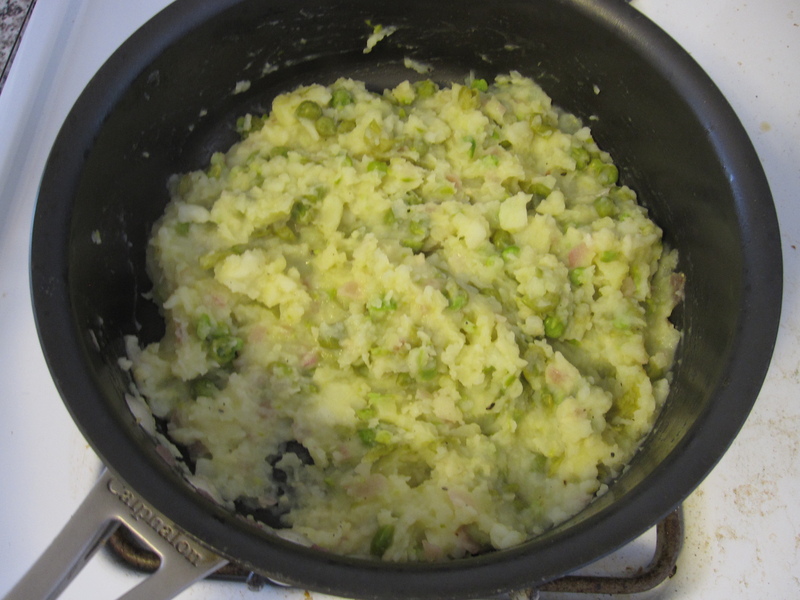 I let that all cook for about 6 minutes before adding some salt and pepper. Then I added the chicken. That took about 6 minutes to cook almost completely. 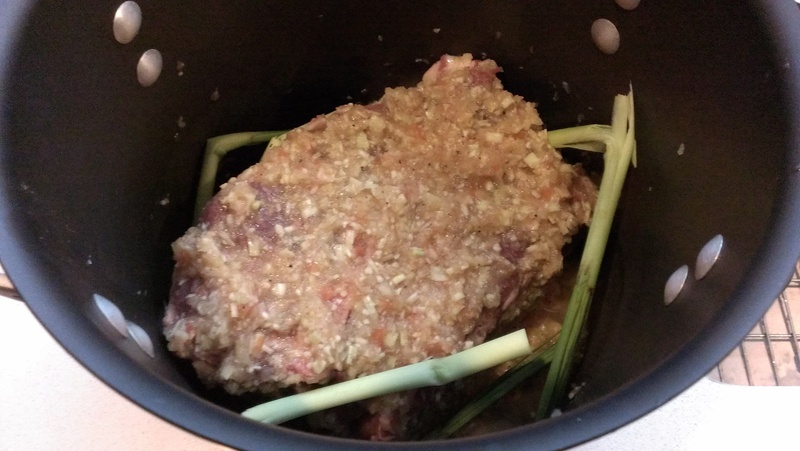 About 1 tablespoon of fish sauce went in to add that distinctive Southeast Asian aroma and flavor. After the fish sauce cooked for a couple of minutes I added the shiitake. About 4 minutes later the tomatoes went in. I let everything come together for about 3 minutes and turned off the heat. 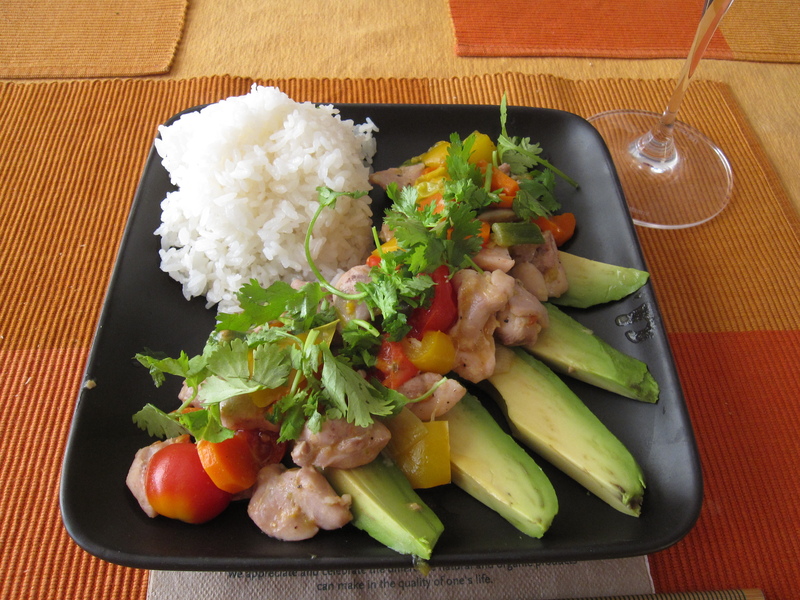 To serve, I put some white rice on one corner of the plate and then fanned out a half avocado on the other half. I put the lemongrass chicken down the middle. 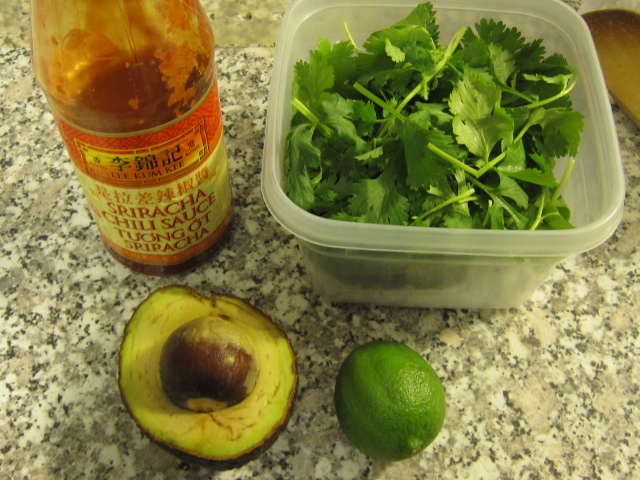 For garnish I tore up some cilantro. 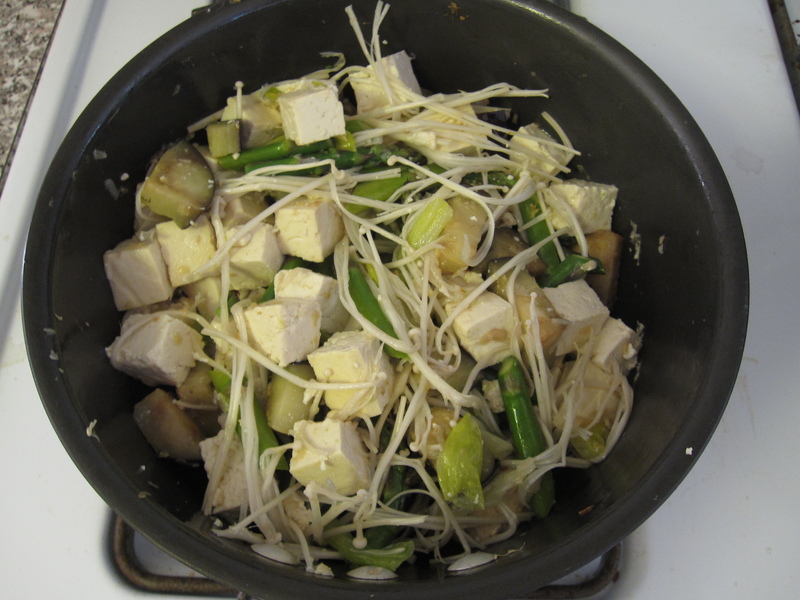 There was enough leftovers for Yuki’s lunch yesterday, so this was a 3 portion recipe.